Grate the marzipan roughly, cook with the cream and cool down. Mix and whip the egg yolk with sugar and butter. Add the finely chopped dried fruits, the creamy marzipan and the cooked pasta. Gently add the hard whipped cream from the egg white, mix and rest for 10 minutes. Apply some butter and biscuits for the pudding shapes or larger coffee cups. Pour the marzipan pasta in the shapes. Place in oven and steam in a water bath or put them in cups and steam for 2-3 minutes. 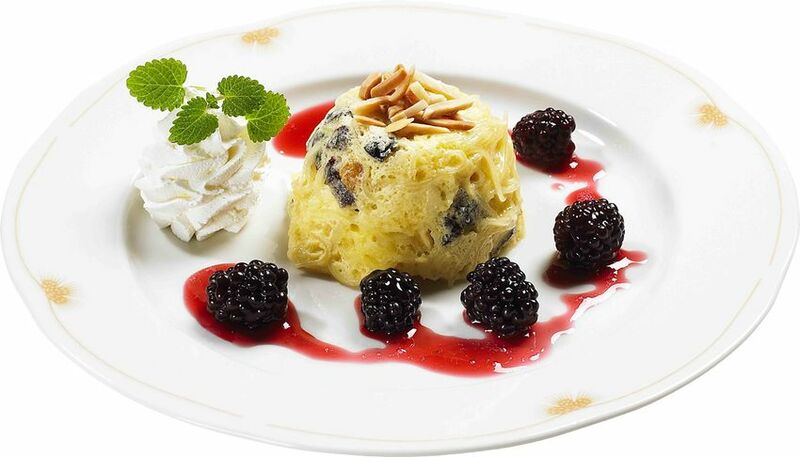 Serve when hot, sprinkle almond on top, whipped cream and blackberry dressing on the side.